All over the world, nautical charts use the same conventions specified by the International Hydrographic Organization. The major symbols and abbreviations are identical. Some colors and some written abbreviations vary with the country and language. For Canadian waters, the official chartmaker is the Canadian Hydrographic Service. They don't sell or give away charts but on their website you can identify the chart you need and find a dealer. You can buy the booklet "Chart No. 1: Symbols, Abbreviations, and Terms Used on Nautical Charts" or download it free from the CHS website. If you are in an area that is also popular with users of sailboats and powerboats you could use a leisure chart from an independent publisher. These have more information about the layout of small inlets and harbors, whether the foreshore is sand or mud, and the location of waterside stores, and they often include a simple tidal atlas of the area. A marine supply store will stock the charts for the local area and will be able to order charts for other regions. You can get others by mail order. See Retail Outlets. 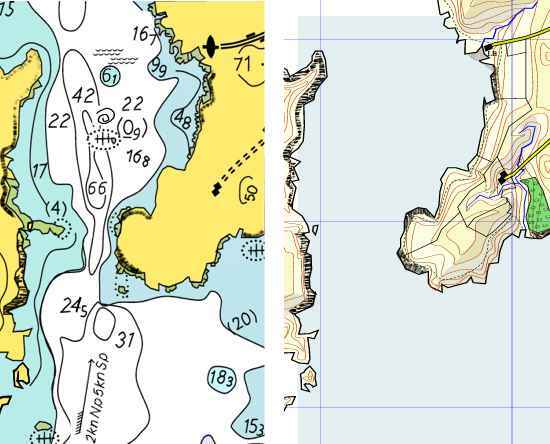 Ideally a sea kayaker will have both a suitable map and maritime chart covering any unfamiliar area (s)he intends to explore. A chart shows the depth of the sea, gives some information about currents, and shows navigation marks and maritime hazards such as shipping channels and military exclusion zones. This imaginary chart extract shows an area with unusually strong tidal streams, as you can tell from the tidal stream arrow and the symbols marking powerful back eddies and overfalls. On a map the sea is shown in plain blue with no indication of depth, and only a hint about the places where sand or mud will be exposed at low tide. The shape of the land is shown very clearly with contour lines which join points of equal height. Where the contour lines are close together, the slope is steep. The shape of the land is also shown on this map by darker coloring for higher land, spot heights and conventional "shadows", and more information is given about land features. 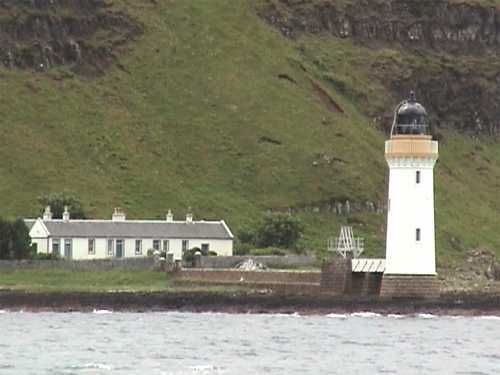 This makes it easy to identify a landmark such as a village, bridge, island, wood or mountain. If you can identify a landmark, you can easily find your own position at sea. Kayakers and hikers seldom go long distances so they prefer their charts and maps to be on quite large scale. 1:50,000 is usually fine for both hiking and sea kayaking. A 1:25,000 map will show more detail, including rock outcrops, vegetation, paths, fence lines and campgrounds. A 1:25,000 chart has more space to show features and hazards that may affect small craft. On a map or chart with a much smaller scale than 1:50,000 your entire day trip may fit into a 2-inch square. For sea kayaking in a remote area you may be unable to get a chart on a larger scale than 1:75,000. See also Distances On A Chart. Below you will see an extract from a chart of a popular kayaking area. It happens to be in Wales but the layout, symbols and abbreviations are almost identical with those on US and Canadian charts. It covers the tip of Pembrokeshire, an area with excellent scenery and wildlife, strong tidal currents which create challenging sea conditions, surf beaches, and plenty of nice pubs and walks if it's too windy for kayaking. It also has some truly exceptional hazards for the sea kayaker. The extract is about one-thirtieth of the whole paper chart. On paper this extract is 6 inches wide. The scale is 1:75,000 so the area covered is a little over 6 nautical miles wide. For a higher-resolution image, click here. To the west you will see a dozen islands called the Bishops & Clerks. The South Bishop is one of the largest, and has just enough room for a lighthouse. This part of the chart has no tidal diamonds. Exceptionally, because there are very fast currents in the area covered by the chart extract, there is a tidal stream arrow halfway up the left side. The arrow has feathers, showing that it indicates the direction of the incoming tide at that location. It states that the flood tide flows at 2 knots during neap tides and 5 knots during spring tides. The sea around the Bishops & Clerks and in the channel between them and Ramsey Island is littered with the twin wiggly lines that mean overfalls and tide rips. That's useful information for a kayaker, enabling you to avoid them either by a sprint across, by going at neap tides, or by crossing the channel at slack tide. In general, see Tides. The magenta box on the chart and the number 1482 indicates that UKHO also publishes a 1:25,000 chart covering only that area. This would be very useful for a kayaker making a first visit to this challenging region. For more about what charts do show, see Features On A Chart. Charts are intended mainly for use by ships and yachts so they have very little information about roads, parking lots and paths, and they leave out many things which a kayaker would regard as a maritime hazard. For example if a headland thrusts out a long way into the sea, it can create a small tide race or turbulent eddyline which is nothing to a ship but troubling to a beginner or intermediate kayaker. Likewise, an underwater reef running out 15 feet from the tip of a headland won't be on the chart, but in a big swell it may unexpectedly create a breaking wave large enough to capsize or loop a kayaker. Another entertaining hazard you may encounter is the blowhole, in the form of a long thin horizontal tunnel into the base of a cliff. When the swell runs into one and fills it up, it may eject a horizontal jet of mixed air and water with the strength of a fire hose. Not on the chart. An experienced sea kayaker who knows the speed of tidal currents in the area can look at a map or chart and accurately fill in a lot of information by guesswork. See the Reef Point illustrations at Kayaking On Fast-Moving Water. • The B-tches, which are either a serious hazard or a white water playspot depending on the state of the tide and your point of view. 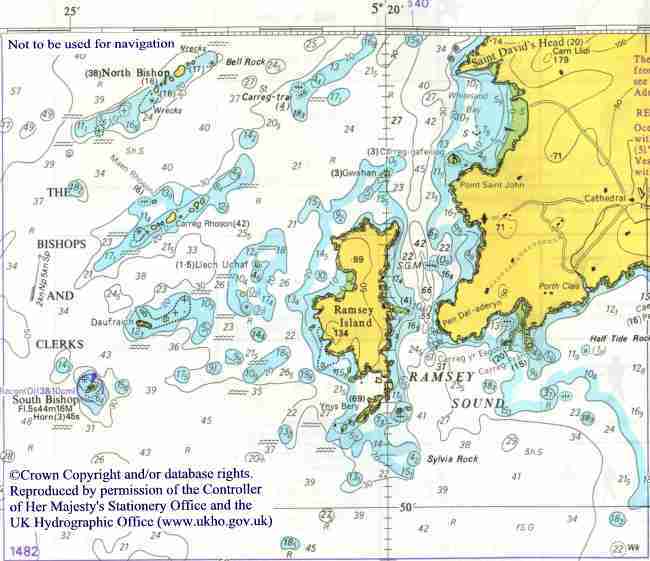 A line of little islands with shallow water between them, they are not named on the chart but appear as a green finger sticking out of the east coast of Ramsey Island. The green color indicates that at very low tides you can walk dry-shod along the line of islands. • The Horse Rock whirlpool, which is that very, very rare thing, a whirlpool that can take down a sea kayak. Horse Rock is not named on this 1:75,000 chart but it is shown as a tiny round dot in the middle of Ramsey Sound, just east of the deep water channel. The chart indicates that it is exposed at very low tides. Its drying height is marked as 0.9 meters above the level of the lowest tides. Note the ship wreck marked immediately alongside it. •. Information about the shape and height of the land. It is often possible to identify an island or section of coast by its shape. On a map, relief is shown by contour lines, by different colors used for land of different heights, by symbols for cliffs, etc, and sometimes by overprinting shadows to give a three-dimensional effect. On a chart, the land is usually shown in one color, and contour lines are either omitted or given only at intervals which are too large to be much use. • The nature of the shoreline. You can't see them on the 1:75,000 chart, unless you use a magnifying glass and some imagination, but there are low to medium cliffs right round the coast except at Whitesands Bay and Porth Clais, with the occasional low-tide-only beach. • Paths you could use to get up from the water in emergency. • Most of the farms, campgrounds and homes that might be useful in an emergency. • The St Justinian car park and steps down to the beach. • The Whitesands beach car park and café. • The small town of St Davids, which surrounds the cathedral marked halfway up the right side of the extract. For those things, you need to look at a 1:50,000 or maybe 1:25,000 chart alongside a pilot guide and the 1:50,000 map. A yachtsman goes to sea with a chart table and a rack of tools,. A kayaker has to do the chartwork before (s)he goes afloat. On the water (s)he will have time only to check to see whether (s)he is still on course and on time. See Navigation Checks While Afloat. You can use your chart at home to work out times, distances, bearings and escape routes for your trip. To take with you in the kayak you can make a waterproof extract of the chart and a note of the times of high tide and slack water. North. Maps and charts are laid out with true north at the top. True north is the direction to the North Pole, which is one end of the axis of planetary rotation. A compass points to the Earth's magnetic north pole which is not a fixed point. See Magnetic Variation. Heading. This is the direction in which your kayak is pointing, which a navigator would describe in terms of its angle from north. Your kayak may be heading 90 degrees, but tidal currents and wind meand that this is not necessarily the direction in which you are going. Course ("intended path"). Your course could be defined is the direction you think you will have to paddle to reach your destination, after allowing for wind and tide, and the time for which you think you will have to keep going. Track ("course over the ground"). Your track is where your kayak actually goes in relation to the sea bed. If you're in a race it may be a straight line, if you're not it probably has a few angles where you stopped to take a photo or eat a sandwich. You'll never know, unless you like using GPS. Bearing. A bearing is the angle from north of a line joining two points. Conventionally, a circle is divided into 360 degrees, so the bearing of something precisely north of you is zero degrees, east of you is 90 degrees, something directly to your south is at 180, and to your west is 270. To help users calculate a bearing with only a orienteering compass, a topographic map has a grid of north-south and east-west lines printed on it. On a 1:50,000 hiker's map the grid lines are often at intervals of 1 km (2 cm on the map). A chart also has a grid but the lines are much further apart, usually at intervals of 4 nautical miles, so a chart has a compass rose to help you calculate bearings. A compass rose is a disc about 2 inches in diameter, printed on the chart. It has an outer ring divided into 360 sections, where zero / 360 is true north, and either an arrow showing magnetic north or an entire inner ring where zero / 360 degrees is magnetic north. The compass rose in the image has writing along the magnetic north line which says "5 degrees 10 minutes W 2001 (9 minutes E)". The figure in brackets is the annual variation. To find the magnetic variation for 2010, deduct 9 minutes x 9 years, which is 1 degree 30 minutes, so magnetic variation for this chart in 2010 is 3 degrees 40 minutes. Let's say you are planning a trip from Mythical Harbor (on the left of the image) to Seal Island. The island lies roughly due east, so plainly the bearing will be roughly 90 degrees. To find the precise bearing, draw a line from the harbor to the island. Transfer that line to the compass rose to see the angle it makes with magnetic north. The easiest way of doing this is to use one of the navigation tools listed here. You find that the angle is 80 degrees magnetic, so that is your heading for a trip to Seal Island - if there is no significant tide or wind. Reciprocal. For the return journey, your heading is the reciprocal bearing. In other words, add 180 degrees. So your heading on the return journey will be 260 degrees magnetic. Your compass points to the Earth's magnetic north pole, not the true North Pole which is the northern end of the Earth's axis of rotation. The magnetic north pole is presently wandering around in northern Canada. The Earth's magnetic field also has flaws and swirls which move around from year to year. The only simple way to establish the direction of magnetic north in a particular location is to use a recent chart or map. If you are navigating with a chart, printed on it in various places will be a compass rose like this one, showing both magnetic and true north. When you have drawn a line on your chart to show your intended route, you can easily find its magnetic bearing by using a straight-edge to transfer it to the nearest compass rose printed on your chart. If the nearest compass rose is printed some distance away you can prepare your chart extract in advance by drawing a grid of north-south lines parallel to the magnetic north line on the nearest rose. When you set off in your kayak, simply use your compass to follow that bearing. So there's no real reason to use true north at all. If you do everything in magnetic you won't have to do mental arithmetic to convert your bearings between true and magnetic. Easy. And if you do your kayaking someplace with a large magnetic variation such as Maine, there's no risk you'll convert the wrong way and end up paddling 40 degrees off your intended course. Magnetic variation in most of Florida is currently so small that most hikers and kayakers disregard it but in Puget Sound it is 18 degrees east, which is often written as +18. In Maine it is approximately 20 degrees west (-20) and up in Newfoundland it is -20 at St Johns and apparently -40 at Battle Harbour. Let's say you are in Maine, you want to go from A to B and your course will be approximately east. Draw your intended course on the map. You find it makes an angle of 90 degrees with the north-south grid lines printed on the map. You must adjust for variation or end up far to the north of B. The variation is west so to convert from true to magnetic you must add it. To get from A to B you will steer 110 degrees magnetic. To convert a bearing from magnetic to true, you subtract a "west" variation. Say you are on the water in Maine and you can see a conspicuous lighthouse. You want to know where you are in relation to the lighthouse, so you use your compass to measure its bearing as 270 degrees from you. If you want to plot that line on your map, the true bearing would be 250 degrees. On the water, it isn't easy to remember whether to add or subtract so people tend to use a mnemonic. For areas with a significant westerly variation, hikers traditionally say "grid to mag, add; mag to grid, get rid". Obviously you would need a different mnemonic for parts of the world where magnetic variation is east. We've mentioned Puget Sound. Variation in Texas also easterly, 10 degrees east or +10. Charts are based on a grid of lines superimposed on the globe. Lines of latitude are like parallel slices through an orange. They are all parallel to the equator and show how far north or south you are. They are longest at the equator and get shorter towards the poles. Lines of longitude are like segments of an orange. They all run from North Pole to South Pole, and are all the same length. They show how far east or west you are of the International Prime Meridian, the line of zero longitude. For historical reasons this runs through Greenwich Royal Observatory in London. We have said that a nautical mile is the length of one minute of latitude. There are 360 degrees in a circle and 60 minutes in a degree. Charts have a horizontal scale of degrees and minutes along the top and bottom, and similar vertical scales at right and left edges. To measure distance, use ONLY the vertical scales. This is important. Lines of latitude are parallel but lines of longitude converge to a point at the poles so a minute on the horizontal scale may be only half what it is on the vertical. The horizontal scale is there so seafarers can calculate co-ordinates.